We’re back with Made it Monday! This time showcasing some of the process that goes into sewing clothes. I love that today, there are electronic patterns that you can purchase, download, and print - and that there are online communities for the different brands/pattern makers so that people can see what people look like in these clothes and offer tips when you’re having difficulty with sewing. Some of the pattern companies that I use the most are Hey June, Itch to Stitch, Patterns 4 Pirates, Sew Straight and Gather - and many others. 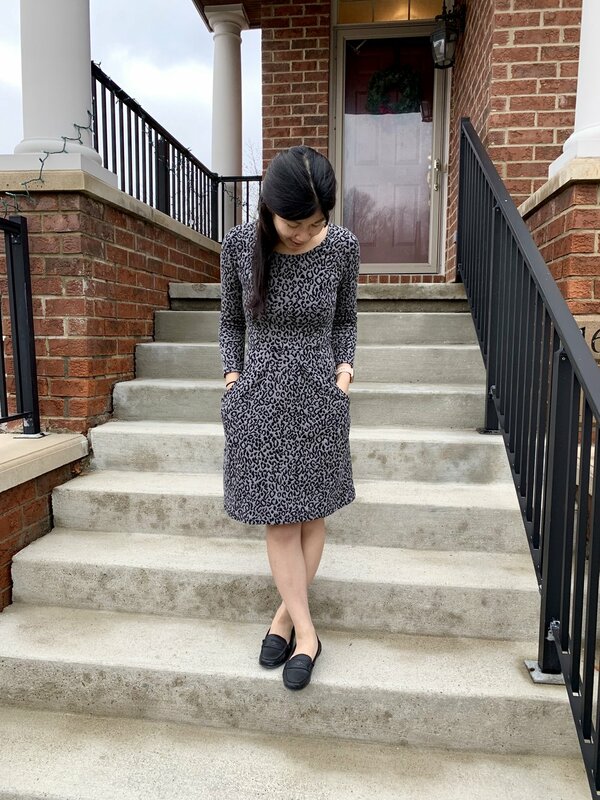 This dress happens to be the Hey June Charleston dress. I’ve made this one before and blogged about a version of it here. It’s fun because you can alter the sleeve lengths, the type of skirt, pockets/no pockets. Once all your pieces are cut out, you follow the instructions for assembly! 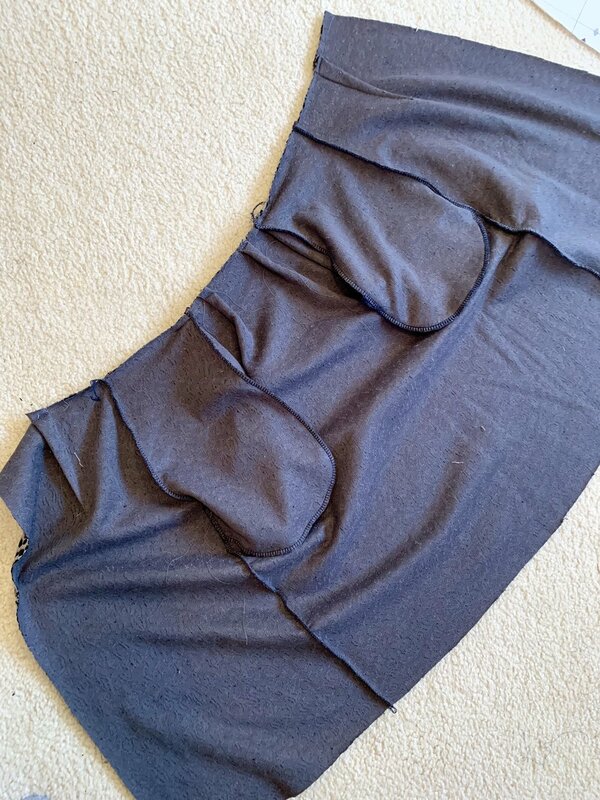 Below is the skirt (the wrong side of it) with its pockets before it’s attached to the bodice of the dress. And that’s it! 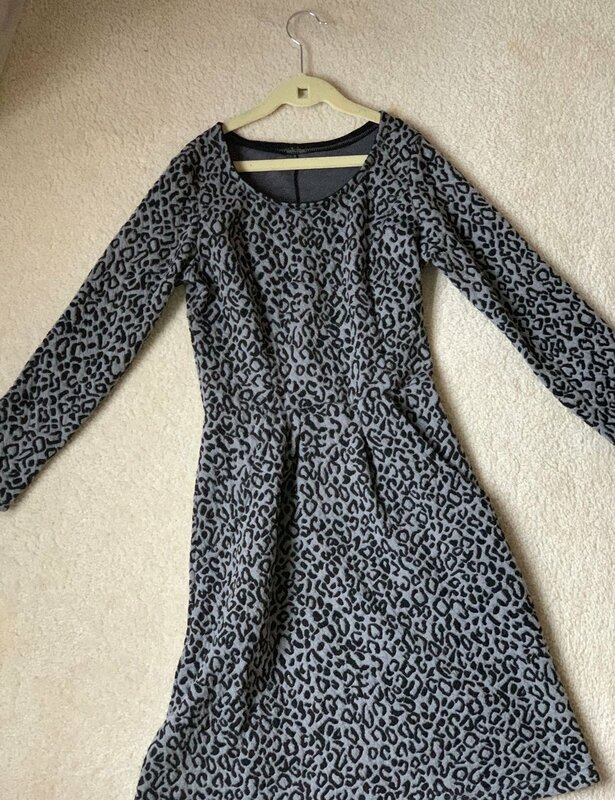 A new dress to wear to work. It really has been a while since I sewed clothing and I haven’t done as much of it during residency, so it was fun to go back to a pattern I was familiar with and create something new. Thanks for reading! This past year wasn’t my most productive year in terms of crafts and sewing. Sometimes there are just a bunch of work in progress projects piled up or it’s too daunting to start a new project where nothing ever gets finished. I found this art print at Ponce City Market’s Top Stitch and thought it was the perfect reminder for finishing projects. So even though residency rolls ahead at full steam, I hope that 2019 will be a year of more crafting, sewing, and sharing it with others. Stay tuned for future projects and crafternoons! 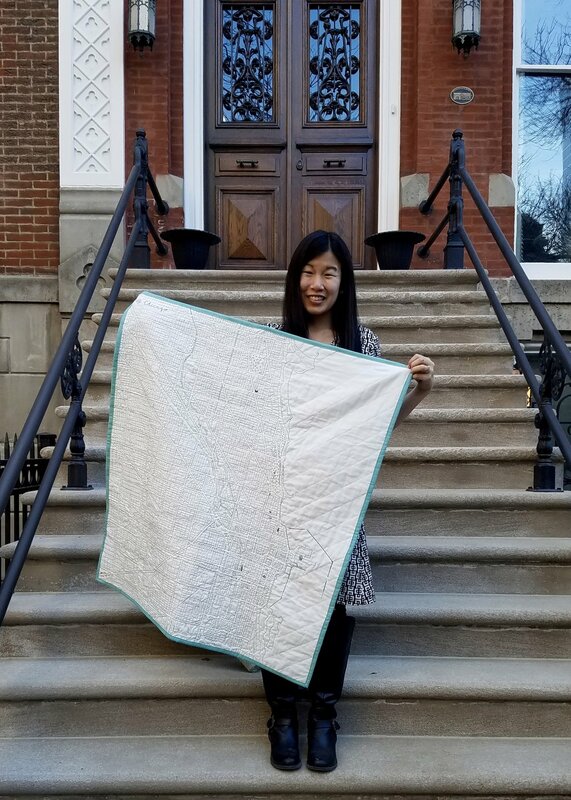 I wrote about the hand stitched Haptic Lab Chicago Quilt back in January 2017 when I was still stitching away....well fast forward to the real deadline of Marissa and Alan's wedding in May, and I knew I wanted to try and finish it for her bridal shower! It did take a long time to make - but then again, I was new to hand quilting/embroidery, and the last step of the project, the quilt binding. I also worked in spurts and was more motivated to finish it at various times - It definitely was a great fourth year of medical school project ;) not the best one to have looming overhead though in residency! ...but all that to say, it's done! and it's been given away! Kyle and I visited Chicago this past weekend for Marissa's shower - It was a fun tea party at The Allis with many of her friends from Chicago and family, and I got to give away the quilt, finally! Here are some photos of it, in all its glory :P Close up photos to see the details as well! Thanks everyone who's been on this quilt journey with me from Syracuse to Michigan :) It's been many a TV episode or Michigan/Tigers/Lions/Redwings/Pistons game on the couch with Kyle, but now this quilt lives in Marissa and Alans' new home! As I get used to seeing the maize and blue M everywhere throughout the hospital and all of the Michigan-ified hospital slogans... (Cancer needs Victors! Depression needs Victors! Research needs Victors!)... Kyle and I have made several trips to the M Den to increase our closet of Michigan stuff, because you can never have enough Michigan stuff, right? They had these really adorable dresses that were tastefully maize and blue, but they didn't get any smaller than a small - so I figured I would have to make my own if I wanted a spirited dress. However, my sewing time has been more limited these days, so I didn't want to start anything crazy ambitious (I still have enough ongoing crazy ambitious projects...). Kyle has informed me that this basketball jersey/number is that of Glenn Robinson III (he now plays for the Indiana Pacers, you might have seen him win the 2017 Dunk Contest) - I'm sure he'd be thrilled that there's potential to make a line of women's dresses out of his college basketball jerseys. who wore it best? just kidding. This is more of a "making it" Monday post because this quilt, despite working on it since Thanksgiving, is going to be finished maybe in 10 years. Just kidding! 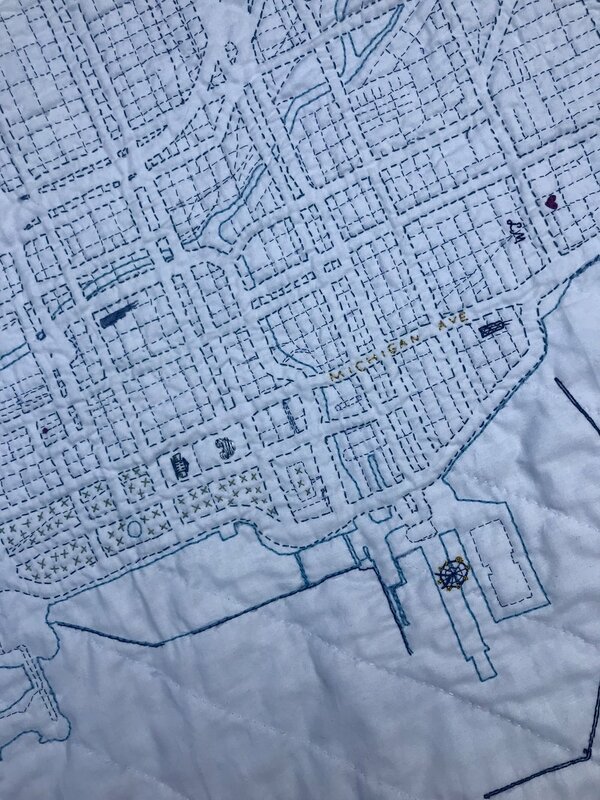 I really loved looking at other quilter's blog posts on these map quilts from Haptic Lab and getting inspiration for this giant project, so I thought I would share my progress, and hopefully inspire others to just go for it if they're on the fence about this type of project! 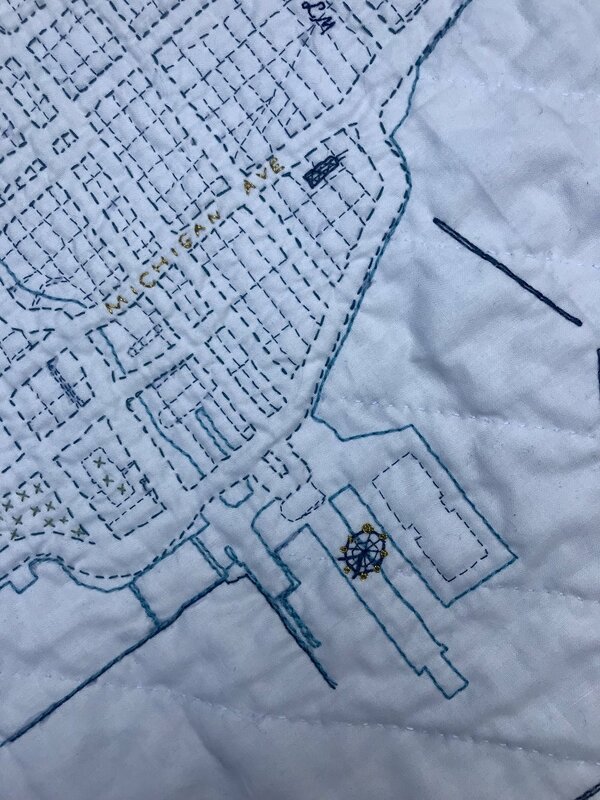 Basically, I set out to quilt every street in Chicago for my dear sister, you know, in case she got lost or something ;) Hand quilting has been quite the challenge and a new skill for me to learn. 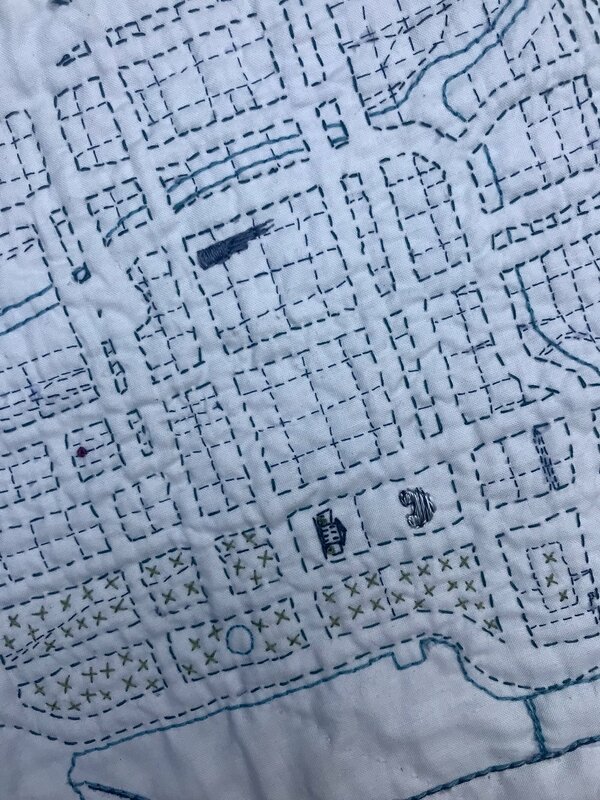 I probably should have stuck with Suzy's miniquilt series, but of course I decided to start with the giant map. On a side note, this is typically how I approach a lot of crafts/things in life. Just go for the difficult, giant, crazy project and figure out how to do it along the way....Ahem I'm looking at you, stuffed Totoro Crochet project that I made despite having minimal to no crochet skills at this time! Safety pinning the map template to the fabric and batting sandwich! For reference, this is approximately 36" x 42"